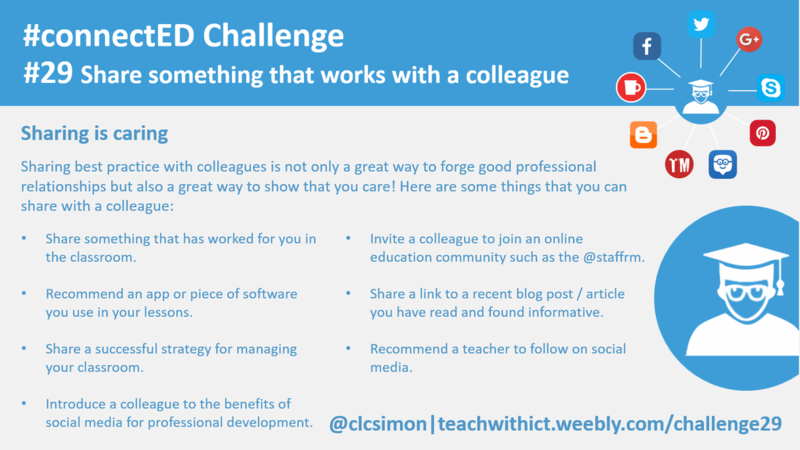 Challenge 29: Share something that works with a colleague. We all have particular strengths when it comes to teaching, for some of us it’s classroom management, for others it’s assessment. Why not share something that works in your classroom with a colleague? Sharing best practice with colleagues is a great way to forge good professional relationships and also a great way to show that you care! Share a strategy that works for you in the classroom, share a great resource that you found online or, if you’re technically minded, show a colleague the benefits of Twitter or Pinterest or even help them to set up an account. Share something that has worked for you in the classroom. Recommend an app or piece of software you use in your lessons. Share a successful strategy for managing your classroom. Introduce a colleague to the benefits of social media for professional development. Invite a colleague to join an online education community such as the @staffrm. Share a link to a recent blog post / article you have read and found informative. Recommend a teacher to follow on social media.